We have a primal desire to fill our brains with information, as animals forage for food. But with the constant and exponential barrage of technology, we are at a near-constant state of interruptions and distractions. “Multi-tasking” is a myth, it’s brain switching …. and we can’t keep up. And everything suffers as result: our sleep, relationships, mood, attention — and performance. How can we break out of the cycle and rescue our brains from high-tech addiction? And how about companies like Facebook — don’t they have a responsibility to design healthier products? 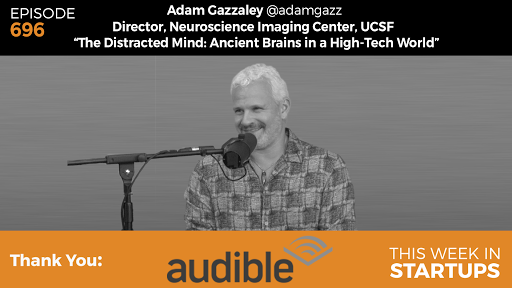 Adam Gazzaley, author of “The Distracted Mind: Ancient Brains in a High-Tech World,” is with Jason today, and has answers. We also learn more about Dr. Gazzaley’s fascinating neuroscience experiments and research, and where we’re headed with the brain and the taking back of control of our attention — and futures.